One of the world’s largest toy makers, Mattel, has long embraced the idea of helping kids build their own toys. Back in the 1960s, the company released the very first ThingMaker, which let kids create figurines by pouring liquid plastic into molds and then heating them up in an oven. Now, Mattel thinks it can bring back the toymaker movement with its own affordable 3D printer. 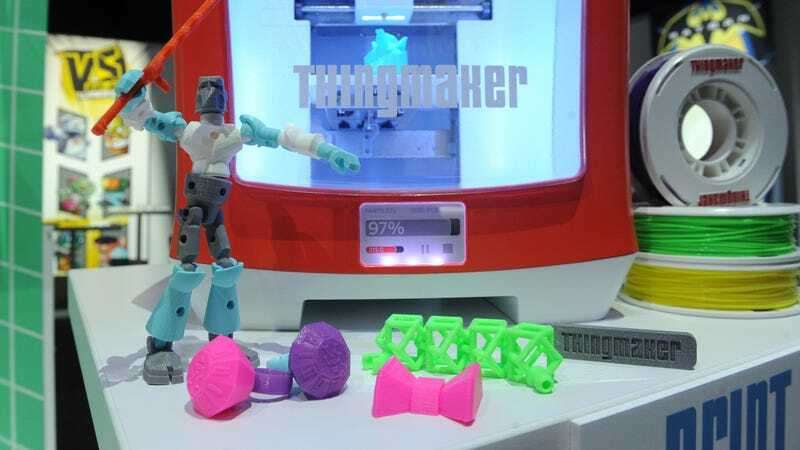 The ThingMaker 3D is an aggressively priced ($300) 3D printer that pairs with an app to allow kids to create a wide range of toys than span both jewelry and figurines. The companion app that operates the printer is actually a very sophisticated 3D modeling software that lets kids or parents render new toys straight from their tablet or smartphone. You can wirelessly transmit your designs directly from your touchscreen device to the printer. Mattel partnered with software company Autodesk to make sure that the app was fast, easy to navigate and wouldn’t crash like so many other poorly made toy apps. Because the software was outsourced to autodesk, it actually works with other 3D printers too—not just the ThingMaker 3D. But that probably won’t matter for most people because other 3D printers aren’t nearly as affordable or as well built at this price. The ThingMaker Design app is already available on iOS and Android and comes loaded with dozens of blueprints that include things like rings, necklaces, scorpions, skeletons, and more. You can pick different colors for different parts of the toy you’re printing out, and you can also customize new toys using simple ball-and-socket joints that are printed on many of the pieces. So you’re probably thinking, “How on earth could this be safe enough for kids to use?” Of course, Mattel has gone through the same thought process, promising that any toy printed from the system is rated safe enough for children 3 years old and up. The heated printing head also retracts when the printer isn’t in use, so little kids won’t try to touch it and burn themselves. As far as it’s ease of use: The ThingMaker 3D is one of the most accessible 3D printers I’ve ever seen. That’s mostly thanks to its ridiculously intuitive app, which makes it super easy for people to understand what they’re printing out and how it would connect to other toy parts. The app also prevents kids from messing up the blueprints and jamming the printing head—which can often be a problem in more professional-grade printers. Mattel’s ThinkMaker 3D will use a hard PLA plastic filament, which has quickly become the standard in the 3D printing movement. Mattel hasn’t announced specifically how many colors will be available at the time of launch, but a spokesperson made it clear that they have the intention of offering a lot. At the New York Toy Fair booth, we saw at least two dozen different colors on display. A Mattel spokesperson also said there’s a good chance that the company will release different printing materials, too. One of the obvious candidates is a softer plastic which they had used to create malleable figurine head. There is also a high probability that Mattel will include glow in the dark plastics or others that change color when exposed to UV rays. For now, there’s no word on whether Mattel will release print-outs for its more well-known brands like Barbie or Hot Wheels, but that seems like an obvious next step for the brand if the printer does well. The ThingMaker 3D will be released this fall, and you can pre-order it on Amazon beginning Monday.